Adult Maccha matches the tearoom. Considering the long history of Maccha, there is a different taste between Maccha grown up in natural farming or using a nitrogenous fertilizer. This was the original taste of Maccha which Juko Murata and Sen no Rikyu loved. Maccha is made from all parts of tea leaves. In ordinary tea, It is only a part to tea ingredient that melt into water. But Maccha, many insoluble components which can’t be taken is also remaining in the used tea leaves. 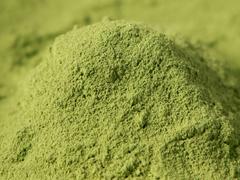 So, that is Maccha is very safe, and a healthy and also effect can be referred to as high.We used to drink as a medicine. Famous component is catechin and caffeine, and vitamin C, An insoluble component is vitamin E and beta carotene with antioxidative effect and CoQ10 for the beautiful skin.It is grateful to have from the natural materials naturally.